How are we treating the problem? Admissions to drug treatment in Essex County, with the primary drug identified as heroin, have surged 60% since 2005, compared to a 45% increase in the state and a 37% increase in Middlesex County. By 2014, heroin and other opioids were responsible for 60% of admissions in Essex County, up from 46% in 2005. 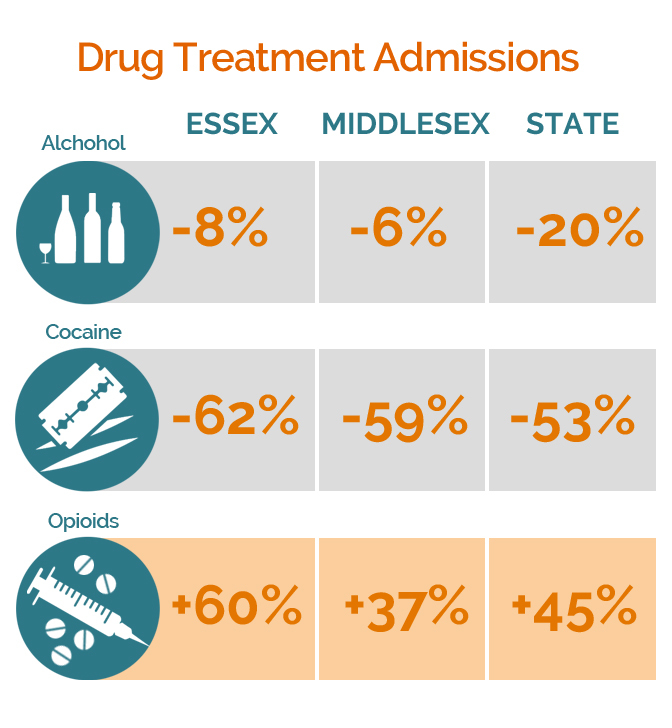 Total drug treatment admissions in the county were up 15% - compared to 4% in the state and 9% in Middlesex. Essex’s rate of admissions, 136 per 10,000 residents, was below the state rate of 154 but far higher than the Middlesex County rate of 90. The High Human Cost of Addiction. 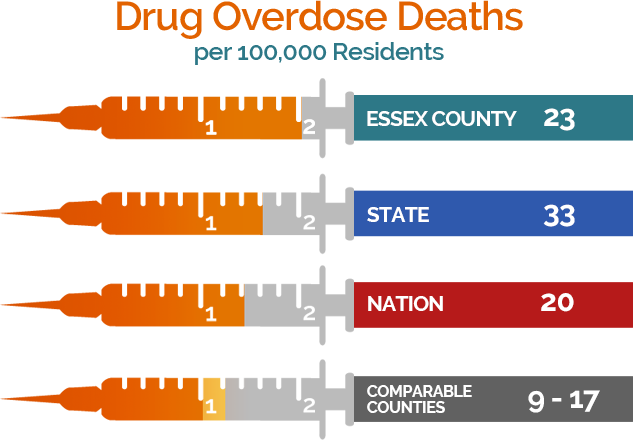 Drug overdose deaths have more than doubled since 2000 to a rate of 23 per 100,000 residents in Essex County – below the state (33) but above the nation (20) and comparable counties (which range from 9 to 17). These figures include deaths from all types of drugs, and both accidental and intentional deaths. Drug-related arrests are up in Essex County, increasing 44% since 2000 to more than 1,000. Drug abuse has far-reaching effects. The available data only tell part of the story – we know that drug addiction has far-reaching effects. Drug addiction, overdose, and arrest all disrupt the life of the user and their family through expense associated with medical care, legal trouble, or the drugs themselves. It can also make finding and holding employment difficult. No one has a full picture of the impact of opioids on a life or a community, but we know they exact a major toll. For more information , we encourage you to read up on incarceration, recidivism, and health care costs.